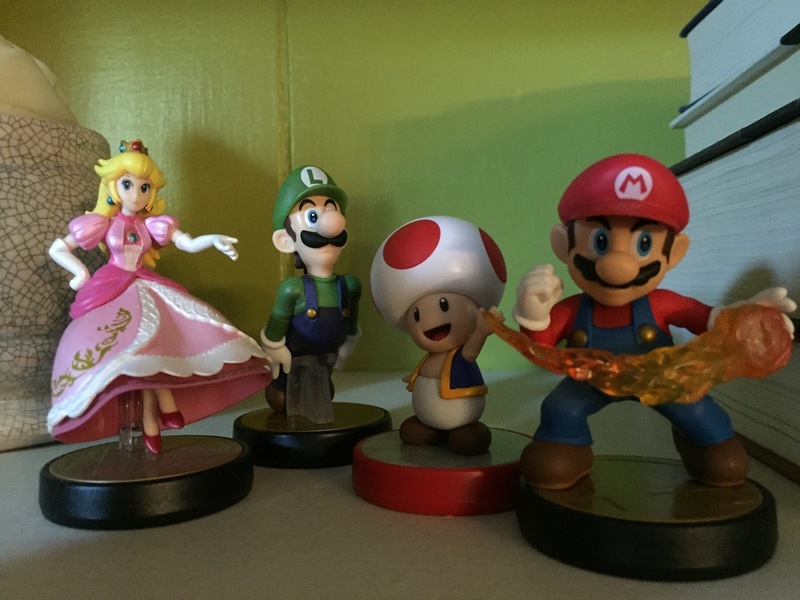 It's been nearly nine months since I first posted about Amiibo. At that time, I had four lonely figures: Samus Aran, Wii Fit Trainer, Fox McCloud, and Link. In the time since then, things have changed. I now have a collection six times that size (24 total figures) that spans Nintendo's core franchises, niche series, and even third party characters. Let's check in on it, shall we? We'll start with Nintendo's core franchise, the Super Mario Bros. series. You might recognize this collection of characters from Super Mario 3D World, which allowed up to four players to control Mario, Luigi, Toad, and Peach. I've posed them here on my bookshelf, as if in a surreal level straight out of the game. I have mixed feelings about Mario's pose; while the meaner look does fit with the Smash Bros. theme, it seems to belie Mario's typically oblivious persona. Still, I think the fireball is executed very well, and adds a dynamic touch. Toad, as you'll notice, has a different base—he's from the Super Mario Bros. amiibo series; either way, his pose matches the character perfectly. Luigi's strange "blast off" pose makes him one of the weirdest amiibo yet; I can't help but wish he was instead posing with the Poltergust 5000 vacuum from the Luigi's Mansion series. And, finally, Peach looks great with a carefree-yet-royal attitude, and her dress has some fantastic detail work. Next, let's move to one of Nintendo's other juggernaut franchises: Pokémon. While I'm not personally a huge fan of the series (mainly due to ignorance), there are a few characters I like. 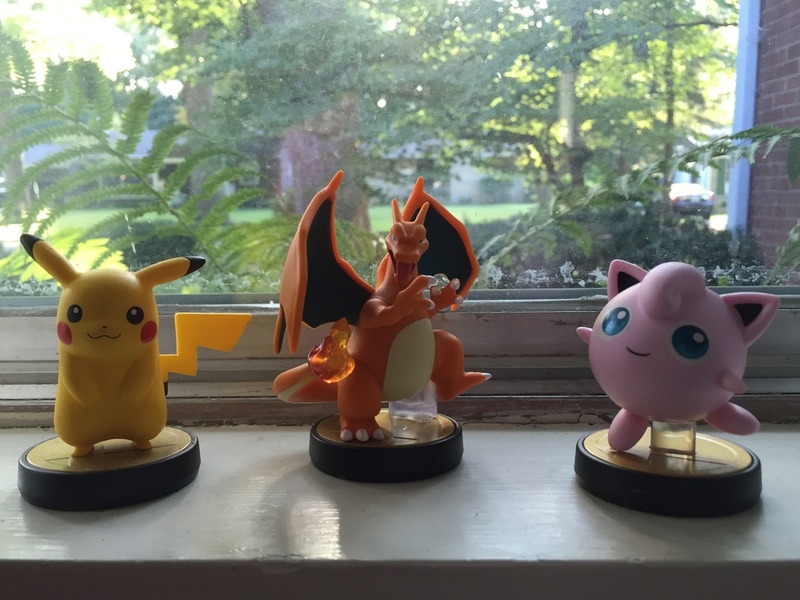 From the available bunch, I've gathered Pikachu (of course), Charizard, and Jigglypuff. Here they are in a "wild" setting, just waiting to be caught. Despite none of these characters having particularly dynamic poses, only Pikacha manages to avoid the use of any plastic wedges or stands, and his figurine is all the better for it. His ears and tail make the whole pose work. Charizard is a pretty rad dragon, and his wings are one of the more unique features of any amiibo so far. The "fire" on his tail seals the deal. Finally Jigglypuff is, well, weird. A sort of Kirby-like character, Jigglypuff is actually an amiibo I got more because it was rarer, and I had the opportunity. I'm sure it's a fine pose, but I'm fairly ambivalent about this one. Moving back to a more "core" Nintendo series, here's my collection of The Legend of Zelda amiibo: Toon Link, Zelda, and (regular) Link. Enough with the green-clad hero getting all the attention—I put the woman herself out in front! Despite being one of the first amiibo I ordered, I think the standard Link figure leaves a lot to be desired: he's looking down, his face is painted a little strangely, and he has a distracting yellow pillar holding him up. For his sake alone, I hope they make a better Link in the future. Zelda, on the other hand, is a near-perfect amiibo: her stance is imposing and refined, her dress has great detail and captures movement nicely, and her eyes really bring the whole package together. Toon Link is, as usually, very cute, and the cartoony quality translates well to statue form. I should also note that both Links have nicely-painted shields! Moving from the forest to jungle, Donkey Kong Country is up next! Donkey and Diddy make up this portion of my collection. Here they are ready to stomp the ground for (hopefully) some bananas or gold coins. I love the way the fur is modeled on both of these characters; the textured look helps mimic the detailed hair modeling that's been incorporated into recent games. Also, despite both characters featuring small pedestals or stands, they're small enough to ignore, and the overall movement captured in the poses more than makes for up it. I've heard some complaints about Diddy's eyes looking strange, but they look normal to me. 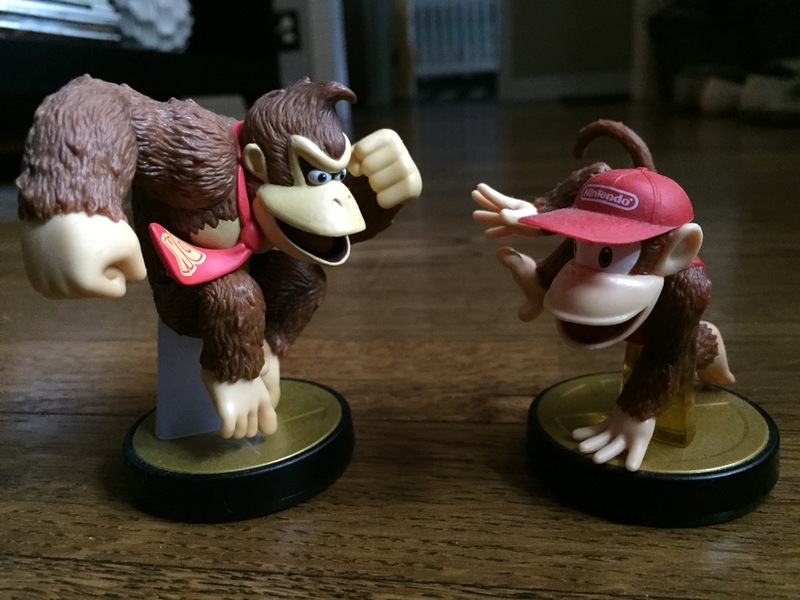 Also of note: Donkey Kong is one of the heaviest amiibo and completely lives up to his on-screen heft. Taking a quick break from Nintendo franchises, here are a few of my "third party" amiibo: Mega Man, Pac-Man, and Sonic the Hedgehog. These amiibo exist, of course, thanks to their inclusion in the Super Smash Bros. for Wii U/3DS rosters. Here they are in front of a record player for no real reason. All three of these look pretty great, with Mega Man being the standout. His classic pose requires no stand and his face is expertly rendered. Pac-Man is the newer version of the character, most notably featured in the Pac-Man and the Ghostly Adventures series (yes, that's a thing). I would have preferred a more "pure" take on the character, but oh well. And Sonic is, of course, running; I wouldn't have it any other way. The next batch are all from different series, but they each feature a very forward-moving pose: Captain Falcon (F-Zero), Wii Fit Trainer, and Fox McCloud (Star Fox). They're all in a diagonal row. 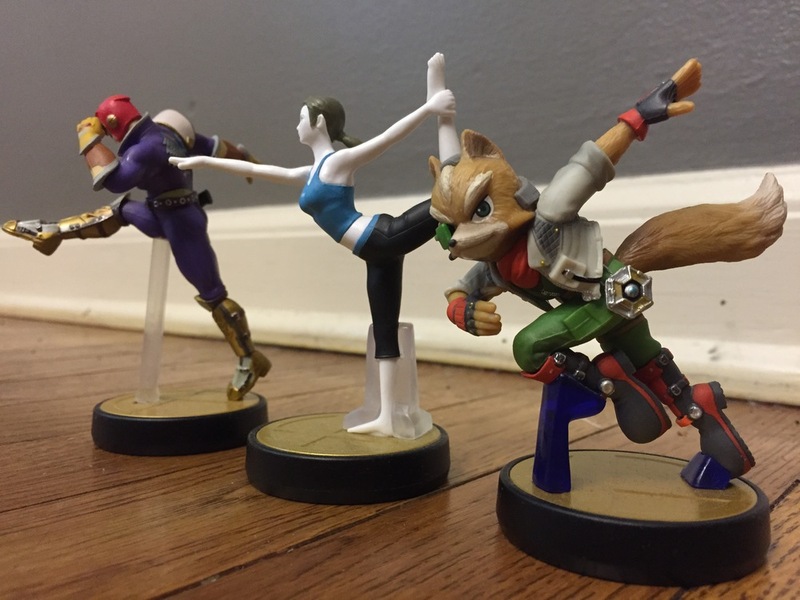 Unsurprisingly, given their high-action poses, they all feature support stands; Captain Falcon's is easily the worst (and mine seems weirdly uneven), Wii Fit Trainer's looks likes a boot, and Fox's are blue and not too noticeable. Fox is probably my favorite of these: great detail, cool pose, and a sweet jacket. Wii Fit Trainer probably wins the award for most random amiibo (she's probably the hardest to explain to someone unfamiliar with Smash Bros.—"why do you have a toy of a lady doing yoga?"). Still, her amiibo captures the mannequin-esque blandess of her character quite well. Finally, Captain Falcon's high-kicking pose is one of the more awkward. The actual character model is quite detailed, but the strange stand unusual pose make this a less-than-stellar statue. On our bar shelf, I've got a few more Nintendo heroes: Yoshi (from his own games as well as some of Mario's), Kirby, Samus Aran (from Metroid), and Ness (from Earthbound). Yoshi's strolling pose is a little awkward, especially since he's looking over his shoulder; he's probably my least favorite of this batch. Kirby's simple shape and adorable expression make his amiibo a perfect fit for the character. Samus Aran is my personal favorite amiibo: the Metroid series (increasingly ignored by Nintendo!) is so awesome, and her character model looks awesome. I love that she's just standing and looking badass: no need for strange support blocks. Finally, Ness (a harder figure to obtain), has a great pose and some nice detail work on his backpack and shoes. Both his inclusion in Smash Bros. and his amiibo make me wish Nintendo would make a new Earthbound game in 3D, especially since I'm finally getting to play Earthbound on the Wii U Virtual Console. And that brings me to the final part of my current collection: the "bad guys." Bowser and Wario seemed an appropriate pair with which to end, since they've both served as an antagonist for Mario over the years. I thought they looked great against the brick of our fireplace. Like Donkey Kong, these two are both heavy hitters in terms of weight and size. Honestly, it's crazy to think that Kirby and Bowser cost the same amount when you consider the amount of detail and plastic needed for each figure. In any case, both of these baddies look delightfully mischievous and ready to cause trouble in the Mushroom Kingdom. The scales on Bowser really help pull together the overall look, and Wario's absurd outfit and mustache bring him to life. The details on his jacket and pants show how far Nintendo's manufacturing process has come over the last year. And there you have it! My updated amiibo collection. As for what the future holds, I already have the "Retro 3-Pack" from GameStop pre-ordered (Duck Hunt Dog, R.O.B., and Mr. Game & Watch), so this certainly won't be the last of my collection. And there's still a larger conversation (for another post) about the what Nintendo needs to do bring the functionality of amiibo up-to-speed with that of other figures, like Disney Infinity and Skylanders. Still, I'm really enjoying collecting these just for the physical statues. They're, on the whole, great characters with a lot of charm, and I love that they're official Nintendo products, not third party licensed merchandise. What do you think? Share your amiibo thoughts in the comments! 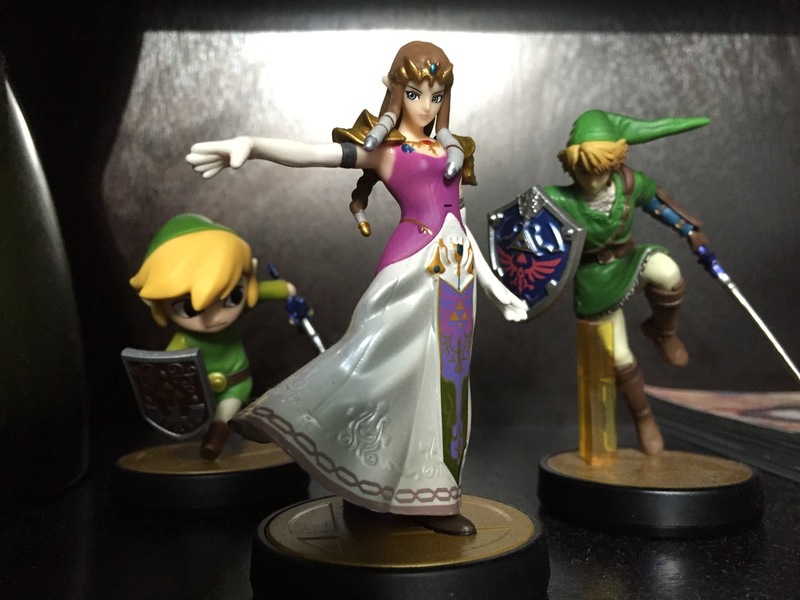 Nintendo's amiibo Figures Have Arrived! Happy Second Birthday, Wii U! Was the Wii U GamePad's Short Battery Life Planned? © Jeff Palmer and The Indy Gamer Blog, 2014 - 2018. Unauthorized use and/or duplication of this text without express and written permission from this blog’s author and/or owner is strictly prohibited. Excerpts and links may be used, provided that full and clear credit is given to Jeff Palmer and The Indy Gamer with appropriate and specific direction to the original content.